The Philippines' leading airline, Cebu Pacific (PSE:CEB), marks the third year of its partnership with the United Nations Children's Fund (UNICEF) through the Change for Good initiative with the expansion of the program to all flights in and out of its hub at the Clark International Airport. Beginning September 1, 2018, passengers on all Cebu Pacific domestic and international flights to and from Clark will be able participate and donate loose change, spare foreign currency or whatever amount they can spare to help vulnerable children in the Philippines receive proper nutrition in the first 1,000 days of their lives. “We are very grateful to Cebu Pacific for further expanding our Change for Good partnership. Now, passengers boarding Clark flights can join in the fight to ensure that children in the Philippines not only survive but thrive. By donating any amount, you invest in the future of Filipino children,” UNICEF Representative Lotta Sylwander says. Change for Good was established by UNICEF in 1987, in alliance with the global airline industry. The alliance is designed to collect spare currency from passengers on board flights of partner airlines with the aim to reach millions of undernourished children in over 150 countries. To date, Change for Good is one of the longest-running efforts of the UN children’s agency. 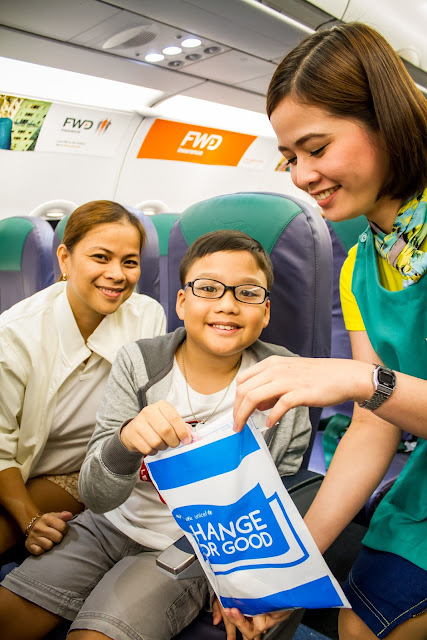 Cebu Pacific is the first and only partner of UNICEF for the Change for Good initiative in the Philippines and Southeast Asia. To date, CEB is also the only local airline partner who raises funds to benefit children in its home country. All funds donated by passengers aboard Cebu Pacific flights for the Change for Good initiative benefit children in marginalized communities in the Philippines. “We are immensely thankful to all our passengers who have donated to Change for Good for the past two years. The program is a practical way to put spare foreign currency or loose change to good use, rather than letting these become clutter in our homes. As we roll-out to more flights, more passengers will have the opportunity to help make a change, and will give hope to more disadvantaged children in the Philippines,” said Atty. JR Mantaring, Vice President for Corporate Affairs of Cebu Pacific. According to UNICEF, the first 1,000 days of life have a significant effect on a child’s future. This golden window of opportunity builds the foundation for a child’s ability to grow, learn and earn. Children who get the right health and nutrition in their first 1,000 days are ten times more likely to overcome life-threatening diseases, more likely to complete more grade levels in school, and go on to earn up to 50% more in wages as adults. Sadly, around 3.4 million Filipino children who are stunted may never reach their full potential due to poor nutrition. The collections from Change for Good supports UNICEF Philippines’ program on ensuring optimal health and nutrition in the first 1,000 days of a Filipino child -- from conception to the child’s second year of life.